Scutia myrtina a small evergreen scandent shrub that is frost resistant, water wise and fast growing in the sun, semi-shade or deep shade. It attracts butterflies but its most important use is as a security barrier. 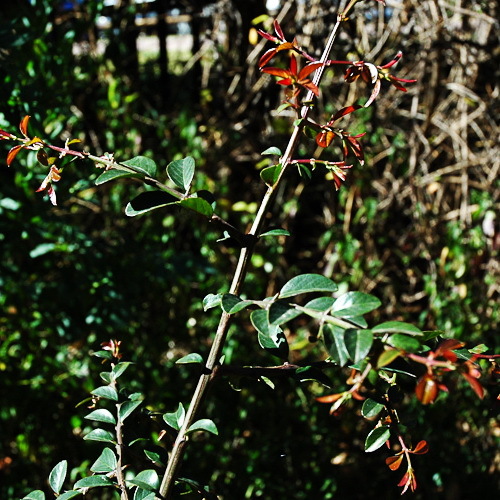 Scutia myrtina is a hardy, evergreen, thorny, drought resistant, scandent shrub with shiny foliage, which grows in shade or sun. 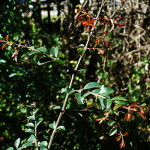 New growth of leaves is bronze. It has fragrant, yellow flowers from Oct. to Jan. and edible fruits that attract birds to the garden.It is also used for nesting sites. Scutia myrtina makes a good addition to a security hedge. (The Cat Thorn has hooked thorns which make it an effective barrier).